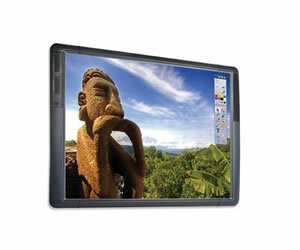 The latest option and best value is the Promethean 78″ Touch. Click the link below for a video demo. Much more than your typical interactive whiteboard, the ActivBoard 300 Pro Range is a hub of activity. Built-in speakers and a discreet but powerful amplifier add stereo sound to any lesson. Fixed mount or motorized height-adjustable stands, short-throw projectors and a durable, classroom-ready surface mean everyone can come to the board—and the board can come to any classroom. Dual-User capability is built in. And with included ActivInspire Professional Edition software and access to tens of thousands of free lessons and resources at www.PrometheanPlanet.com, 21st century teaching truly comes full-circle, culminating in a 360-degree learning experience unlike any other.